Here is how I see the top picks going off the board. As a result at this point I like the Bills chances of trading up and getting one of the top QB’s in this draft. 1. Cleveland- The Browns will take QB Sam Darnold-USC. There is a ton of talk that they will take Josh Allen. 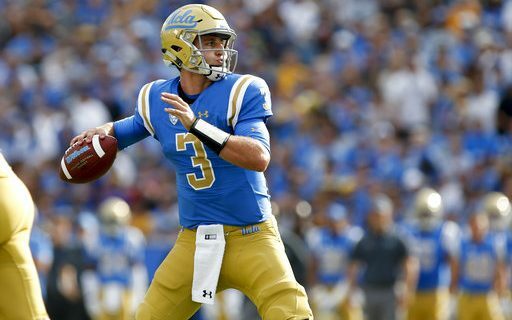 Although Allen has arguably a higher upside than Darnold I can’t see the Browns not taking the USC product. His ability to throw on the run is the best from any of the QB’s in the draft. Jimmy Haslem, the Browns owner, was seen sitting with the parents of Darnold at his pro day. Since then I’ve felt they will go with Darnold as the face of their franchise. 2. NY Giants- Bradley Chubb- DE NC State. Rumor is that the only way the Giants go QB is if Darnold is there. I don’t see Darnold being there so the Giants go defense. Remember the G-men just got rid of Jason Pierre Paul. The Giants have a history of winning Super Bowls with a great pass rush. They beat the Patriots twice this way. The Giants take the best pure pass rusher in the class. 3. NY Jets- Baker Mayfield- Oklahoma QB- The Jets paid a bundle to move up from six to three to get a QB. Mayfield will do well in New York City. In fact you might say that he has the perfect personality to handle the NY media. You can see other markets where he might rub people the wrong way, but NY City isn’t one of them. He thrives here. 4. Cleveland Browns- Saquon Barkley RB Penn State- The Browns transformation begins with this draft. The Browns defense was actually decent last year. They needed to bolster their offense. Talk of them trading down would go out the window when they can get Darnold and Barkley to help bolster their inept offense. This is the point where I believe the Bills start making calls to move up. Denver is at five. The national media believes they are taking a QB. I don’t buy it. I’ve been reading more of the local media and they believe they go elsewhere. The Broncos just paid Case Keenum a ton of money for this year. They still have first round pick Paxton Lynch around. Lynch came out of Memphis as a guy that could take a couple of years to develop. I can’t see the Broncos just giving up on him right away. If the Broncos stay here I believe they take the sure thing in Quenton Nelson of Notre Dame. The price to move up from twelve to five starts to become reasonable. Just using the draft chart as a gauge, knowing it’s not gospel, the price of pick five is 1700 points. The Bills have 1980 points total with their two first round picks. At this point there is still Josh Rosen and Josh Allen on the board. I believe the Bills will trade up and grab one of these two. The Bills can’t wait too long. Although Indianapolis, Tampa Bay, Chicago, San Francisco and Oakland are the next few picks and they won’t take QB’s those teams are prime trade partners for Miami at 11 or Arizona 15. The Bills want to get their QB and still hold onto their second round picks. They desperately need a LB and WR. They need to be able to take these positions in round 2. At this point this is how I see the draft breaking out.